Looking good, thanks for the updates! I've seen mention of a Russo-Japanese War Scenario in the works. I'm wondering what ships will be modeled? Last edited by em2nought; 04-24-2018 at 01:06 PM. Reason: include the word "War"
Basically it will be small ships, most of which you have already seen. So far we have nothing to surprise you. Subscribe to us on Facebook. Oh, I was hoping to see Mikasa, Borodino and their like. We do what we can, not what we want. This is also a lot for a long deceased genre. The model of a battleship like Mikasa or Borodino is long and expensive. Unfortunately, there are very few fans of such games as ours. We can not immediately pay for the creation of such models. Initially, therefore, we will make the game scenario with simple models, and then we'll improve it as much as possible. I often wonder why there isn't more sharing of content between game developers. I'd think Norm Koger could sell the model files from his games for example. It's not like it's going to hurt the sales of his games. He could really make a nice 3D interactive replacement for "Jane's Fighting Ships" out of his models also. I bet he could even sell some of those, maybe more of those than he sold copies of his game, and at a higher price. Jane's Fighting Ships of WWI is $70 on Amazon. For large and expensive games like shooters, many ready-made models. Our period and 3dmodeld are very special. We try very hard, but our possibilities are limited. And do not forget that we have a job and a family. - Now players will be able to use the ships armed with torpedoes in the strategy (TBS) and simulator (SIM) mode. Automatic and manual torpedo control is available. - New types of ships were added: a Spanish torpedo boats destroyer and a coastal defense ship, an American auxiliary cruiser. - American 1150t patrol gunboats rearmed with 4-inch rapid-fire (QF) weapons. - In order to achieve a more realistic appearance in the simulator mode, we improved the water surface graphics (sea waves). 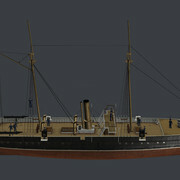 - Improved textures and detailing of all 3d models of ships. Is it possible to build new ships in the Philippines campaign?? Do we receive reinforcements of any kind or we are stuck with what we have at the beginning of the game? New ships can not be built. There will not be reinforcements. Back in April, the largest and one of the most respected professional online magazines about the wargames WARGAMER.COM included our games in the list of the best naval war games. The news was a little late, but better later than never. It's nice to be together with such games as JUTLAND, VICTORY AT SEA, SILENT HUNTER and BATTLESTATIONS: PACIFIC. 1. TBS mode. The division of all the harbors in the shallow and deep. Now, large ships will not be able to enter the shallow harbor. 2. TBS mode. The probability of a ship undermining a minefield depends on its size. 3. TBS mode. The probability of a successful attack of a submarine depends on the size of the target. 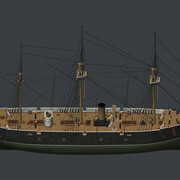 Spanish 1st class iron gunboats built in the 1880s.